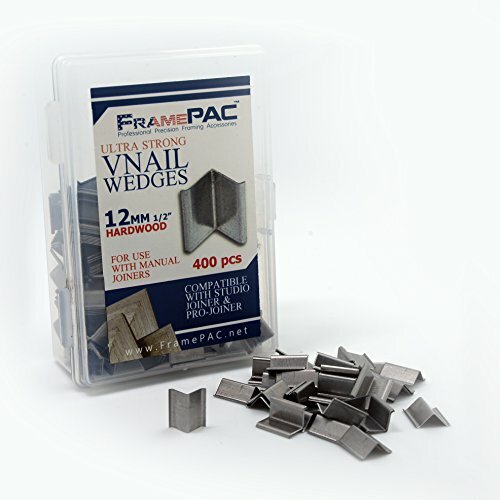 FramePac are proud producers of high quality framing hardware for picture framing professionals. Please click on our brand at the top of the page to see a full range of our products. Our Vnails are made of hardened steel and can be used on hard wood as well as soft wood. Use these with confidence in your corner joining nailer tool, including the Logan Studio Joiner and Pro Joiner. If you are are professional picture framer then please check out our bulk packs as they represent excellent value. PROFESSIONAL PRECISION framing Vnails for picture frame corners. 400 V-nails loose in a pack, not stacked. ULTRA STRONG - made of hardened steel. These V-nails can be used on hard wood as well as soft wood. EXCELLENT VALUE BULK PACKS AVAILABLE - see also the 3000 stacked V-nail packs. FramePac are SPECIALISTS for frame making and frame hanging hardware and supplies. Please click on "FramePac" above to see our full range of products. If you have any questions about this product by FramePac, contact us by completing and submitting the form below. If you are looking for a specif part number, please include it with your message.